Wrist stretching techniques are important because they not only improve your hand coordination, but they also encourage better blood circulation coursing throughout your body. Strong wrists and forearms are also necessary for performing other exercises. By strengthening your wrists, you can prevent injury during your workout! Finger locking. Finger stretches decrease office-related hand tension and stiffness. This exercise can be performed anyway and requires no equipment. Stretch fingers pointing outward then clench into a fist. Then, use one hand to gently pull back against the fingertips of your other hand. Perform these stretches regularly whenever convenient. Reverse wrist curls. This wrist-strengthening exercise requires dumbbells or a barbell. 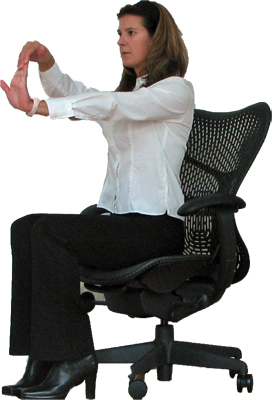 To begin, sit upright on a bench or chair with your forearms resting on your thighs. Hold the dumbbells with palms facing outward. Curl your wrists so that your palms are facing upwards with dumbbells in hand. Repeat as necessary. Gripping exercises. Squeezing a stretch ball on a regular basis not only decreases tension, but improves circulation in stiff joints and hands. Clench the ball firmly for ten seconds and then release. Repeat whenever convenient throughout the course of your day for improved hand and wrist endurance. Wrist and forearm stretches are hugely beneficial for office professional confined to work on a keyboard and computer. Prevent fingers from locking through frequent stretching. Additionally, strengthened wrists significantly reduce the risk of a sport or exercise induced injury. Remember – these exercises will be most effective when combined with Perfect Curves breast enhancement capsules and Perfect Curves gel. This combination will give you the body you've dreamed of! Order Perfect Curves today – let us help you make your dream come true. Perfect Curves should be taken as part of a healthy lifestyle and individual results may vary.